Businesses must diversify their workforce and leadership to avoid alienating consumers. The makeup of Corporate America's boardrooms needs to mirror the evolving diversity of the American people. If corporations are not sufficiently diverse across a broad range of criteria, they risk launching marketing campaigns and products that are out of touch with modern-day consumers. 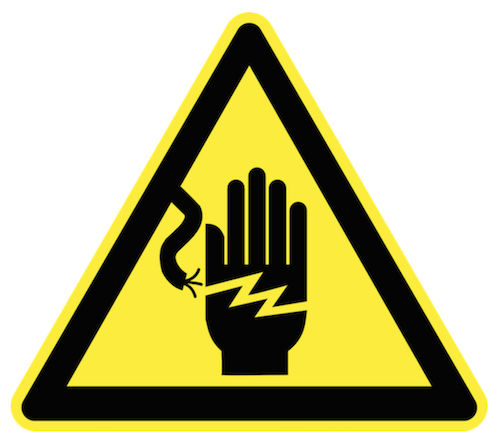 Potentially, corporations could expose themselves to scandals as they offend certain groups. In time, they could become irrelevant and obsolete. Recently, several corporations received backlash in the media for broadcasting insensitive content to the public. We can partly attribute these blunders to a lack of diversity and sensitivity among key decision-makers at these companies. In recent decades, we have witnessed television, advertising, and media become increasingly sensationalized. Networks are more aggressive in their attempts to attract viewers. To grow their audience, they market outlandish shows, like Naked and Afraid, a show that challenges two naked strangers to survive for 21 days in the wilderness. These shows become more outrageous and salacious. A new Czech television show, called Holiday in the Protectorate, has prompted questions about what content networks can broadcast under creative license and what content is so offensive it alienates consumers and business partners. In this eight-part series that concluded in mid-June on Czech public television, a family lives for two months in a realistic simulation of Nazi-occupied Czechoslovakia. The show is a game where the family will win $40,000 if they "survive," thus heightening the level of insult. Closer to home in the United States, brewer Anheuser-Busch is grappling with its own media debacle relating to its Budweiser brand. This past April, a Bud Light marketing campaign featured the tagline, "The perfect beer for removing 'no' from your vocabulary for the night #UpForWhatever." Anheuser-Busch received a firestorm of criticism in the news and on social media for undermining the inviolability of "no means no," arguably promoting sexual assault. What links these two media missteps together (besides the glaring bad taste and insensitivity) is that both received approval from multiple levels of management. Indeed, it seems that not a single person with authority recognized the inappropriateness of these projects and stopped their release. This leads us to ask how these two projects could have been greenlit despite the fact that they are clearly offensive to many people and send the wrong message to consumers. We believe the answer partially boils down to a lack of diversity. Despite ever-increasing calls for more diversity in large corporations, progress is stubbornly slow. It should come as no surprise that there are only two women on Anheuser-Busch's 14-member board of directors and only a single woman on its 16-member executive management team. Perhaps Bud Light would have been spared from recent criticism if there were more women and people with common sense in the room to pump the breaks on this train wreck of an idea. The lack of gender diversity at Anheuser-Busch is not unique. 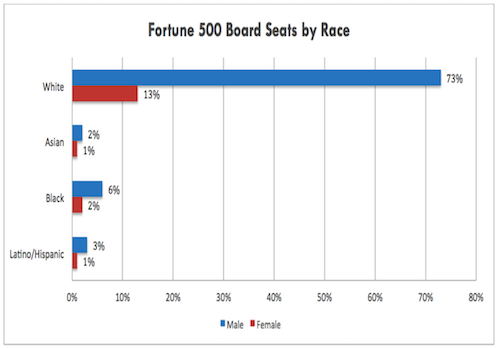 As noted in the chart below, major Fortune 500 companies lack not only gender diversity but also racial diversity in their boardrooms. There are clear economic benefits that come from increasing diversity. One 2012 study by McKinsey & Company found a correlation between companies with diverse executive boards and returns on equity. 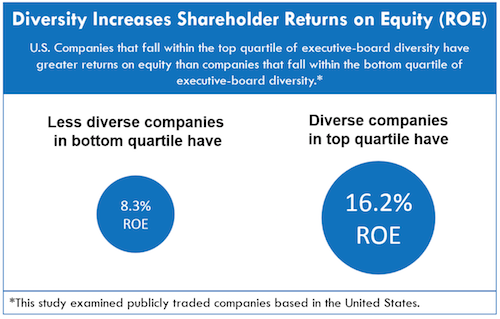 Companies with diverse executive boards that fell into the top quartile of the companies studied had a 95% higher return on equity than those in the lowest quartile. This number implies that diversity can promote shareholder value and returns on investment. 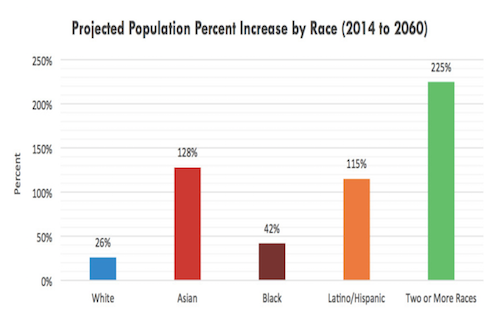 The United States Census Bureau predicts a sharp increase in minority populations over the next 50 years. Companies with greater diversity are better positioned to perform well with this demographic shift and generate returns for investors. Companies that commit to building an increasingly diverse workforce can help identify and stop corporate faux pas. As a result, this could prevent the erosion of a business's customer base and ensure continued financial success. Anheuser-Busch and Czech Television are just two examples of many companies that are failing to keep up with new demographic and social trends developing in our society. Thankfully, not all corporations are stuck in the past. Incoming Cisco CEO Chuck Robbins recently overhauled his company's executive team, saying, "With the increasing pace and complexity of today's market, it's critical that our leadership team understands our customers; delivers results; brings diverse perspectives and experiences; and builds world-class, highly motivated teams." Mr. Robbins is betting that his new executive team will keep the company abreast of the competition by bringing various new ideas to the table. His 11-member executive team now has five women—an increase from only two. At The Azara Group, we could not agree more with Mr. Robbins's business strategy. This strategy is a step in the right direction. To elevate Cisco's progress further, he should focus his attention on racial diversity. We believe in the potential and the necessity of a diverse staff to help companies thrive in the 21st century. We work with our clients to help them diversify and utilize their workforce to remain competitive in an evolving marketplace. Changing with the times will save us all from the "no doesn't mean no" marketing campaigns or televisions shows that profit from simulating the atrocities of Nazi Germany. The Azara Group (TAG) is a consulting firm that promotes the development of leaders in an increasingly competitive and diverse marketplace, providing strategy consulting services and leadership training services to advance professional and life success. TAG leverages expertise in career strategy, diversity, negotiation skills, and business acumen to provide strategic advice and consulting services to help people and organizations get what they want, achieve their goals, and advance their business and career objectives. TAG also helps companies better attract, retain, and promote diverse talent and develop robust diversity platforms and strategies to create a more inclusive workplace. The Azara Group welcomes your direct comments and feedback. We do not post comments on our site at this time, but we value hearing from our readers. We invite you to share your thoughts with us. You can contact us directly at [email protected].